In 1950 Piet Elling combined two hotel rooms in Amsterdam's Carlton Hotel into an apartment for Kees van der Leeuw, director of the Van Nelle Factory. Bart van der Leck provided the colour scheme. 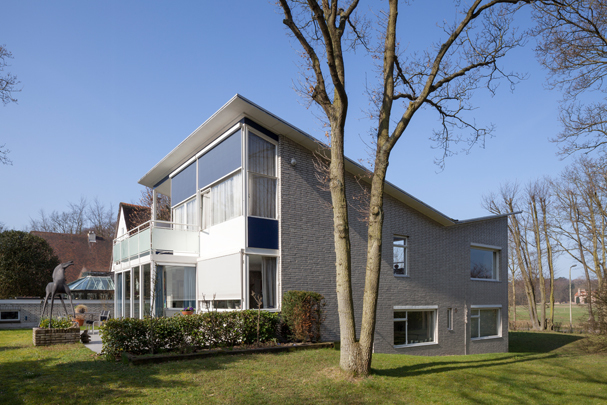 Some years later Elling designed a free-standing house in Wassenaar for Van der Leeuw, by then president of the board of curators of Delft Polytechnic (now TU Delft). The split-level configuration was prompted by the topographical variations on site. The choice of a butterfly roof also derived from the contours of the landscape. Parts of the Amsterdam interior reappear in the house. Van der Leck's colour scheme of geometrical shapes in primary colours was only adopted in part. In the living room there are strips of blue and yellow where walls and ceiling meet and a striking trapezium-shaped patch of red above the fireplace. The kitchen has a rotated blue square on the ceiling and there are red and yellow patches in the bedrooms. The door of the kitchen and that of the guest room opposite it are painted yellow and red.